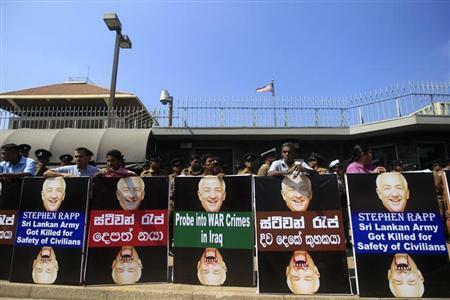 COLOMBO (Reuters) - The U.S. embassy in Colombo posted a photograph on Twitter on Thursday which it said showed a site where the Sri Lankan army killed hundreds of families towards the end of the civil war in 2009, prompting an angry response from the military. The final few months of the 26-year conflict were by far the bloodiest, and the government and Liberation Tigers of Tamil Eelam (LTTE) rebels blame each other for the deaths of tens of thousands of mainly Tamil civilians. President Mahinda Rajapaksa's government, which ended the war in May 2009 by crushing the rebellion, is sensitive to criticism at a time of growing international pressure to investigate allegations of war crimes by the armed forces. The United Nations has called on Sri Lanka to punish those in the military who were involved in atrocities, and a summit of Commonwealth leaders in the capital Colombo in November was overshadowed by the dispute. On its twitter account, the U.S. Embassy in Colombo posted a picture of Stephen Rapp, Ambassador-at-Large for War Crimes Issues at the State Department, and U.S. Ambassador to Sri Lanka Michele Sison at a site where 2009 clashes took place. It is accompanied with the words: "St Anthany's Ground - site of Jan 2009 killing of hundreds of families by army shelling". Rapp is on a fact-finding mission to northern areas of Sri Lanka where the fighting was concentrated. Military spokesman Ruwan Wanigasooriya said the claim was baseless and the embassy tweeted "without verifying the facts". "It appears they are trying to justify their claim and create a situation (leading to) an international probe." British Prime Minister David Cameron said during the Commonwealth summit that he would push for an international inquiry into allegations of war crimes if Sri Lanka did not conclude an independent investigation by March. Wanigasooriya said the area where the photograph was taken was used by Tamil Tiger rebels to hand over dead bodies, and rebels would have considered it safe because it was not shelled. Karunatilake Amunugama, secretary to the Foreign Ministry, said the government would seek clarification from the U.S. embassy on Friday. The tweet came hours after hundreds of people linked to Rajapaksa's ruling coalition protested in front of the embassy against Rapp's visit to the north. Asked about the contents of the tweet, a senior official at the U.S. embassy said Rapp and Sison toured a number of sites from the final months of the conflict and met many survivors. "These are among the reports we heard and that is why credible, independent investigations must take place," the official told Reuters, declining to be named. Separatist Tamil Tiger rebels renowned for suicide bombings battled government forces from 1983. Rights groups and witnesses say the worst atrocities occurred at the end of the war. A United Nations panel has said around 40,000 mainly Tamil civilians died in the final few months. Both sides committed atrocities, but army shelling killed most victims, it concluded.